In what could be the biggest change in political media technology since the televised Nixon-Kennedy debate, the 2012 Mitt Romney for President campaign has free Apple iPhone and Google Androidv Apps available on the App Store and Android Market for Mitt Romney's announcement of his choice for a Vice-Presidential running mate. "It’s a question everyone’s asking: who will be Mitt Romney’s VP? There’s no telling when that answer might come. 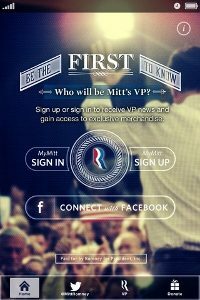 But when it does, be the first to find out and access exclusive content with the Mitt’s VP app. Just download the app and when Mitt decides on his running mate, you’ll get an exclusive notification from the campaign letting you in on the exciting news before the press and just about everyone else (except maybe Ann)."